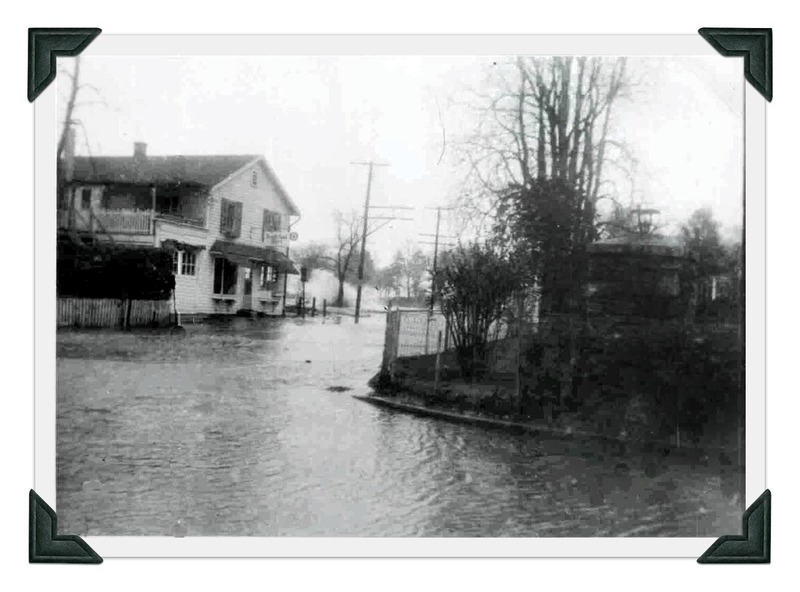 It shows the corner of Compo Hill Road and Hillspoint, during Hurricane Carol in 1954. What is today Positano’s was then called Joe’s Store. Joe’s Store was there in 1954. Cafe de la Plage was there in 1984. Positano’s is there in 2014. Now though, there’s no telling what that corner will look like — in good weather, and bad — in 2015. This entry was posted in Beach, Looking back, Weather and tagged Cafe de la Plage, Old Mill Beach, Positano's, Schlaet's Point. Bookmark the permalink. We moved to Burnham Hill in 1961 and the building that is today Positano’s was also Cafe de la Plage in 1961. And it was also deluged by Tropical Storm Irene in August 2011 – I took photos of the beach from the side of Positano’s at storm passage which also was nearly astronomical high tide and over 2 feet of water was flowing from the beach around the restaurant onto Hillspoint Road. Sandy obviously topped that by several feet but at the evening high tide after sunset, reducing visibility of the flooding. Sorry to see another Westport beach scene being eliminated. Thank goodness people keep photos and records of events. Love seeing these older photos! It would be cool to see a montage of sorts, showing flooding storm waters, hurricane damage and costal effects from over the years. I may be wrong, but I could swear that before it was the Cafe de la Plage, it was a restaurant called Leo Williams. People who worked at the Westport Country Playhouse used to hang out there after the show. I’ve read that one cannot have a primary memory at age 2, but that’s what I claim to have… looking down from the family’s ’52 Chevy during Hurricane Carol and seeing South Compo Road all but washed out. It’s my first memory of Westport and that photo brought back the feeling. I hope there is a way to save Positano’s as a place where residents can congregate and enjoy the Mill Pond view. BTW, looks like “Joe” was living over his store? Leo Williams was Cafe de la Plage, a well known Bon vivant and beloved proprietor of the Cafe…. a good friend of my mom’s. If a property is zoned for business, do you need a variance to make it residential? Stephanie, I think the area is a residential zone and this property is grandfathered as a non-conforming commercial use. But perhaps a real estate lawyer with zoning expertise will weigh in here. Cafe de la Plage apparently incorporated in late December 1957. It was definitely open by August 1958 because there is a newspaper account of Bert Lahr having a birthday meal at Cafe de la Plage at that time. Kenny’s original location was at the corner of South Compo and Green’s Farms Road (or Bridge Street), I believe. He relocated when I-95 was built. At least, I think that’s what happened — it’s before my time! I’ll always remember Hurricane Carol because I had a sister named Carol. And also a tree from atop the hill next to our house on Narrow Rocks Road came tumbling down as we watched. Thank God the top branches of the tree just brushed our house. We were lucky.